The same level. Four hours. No way out. No other accessible saves. Nothing to do but fight the impossible boss battle over and over again. Mike gestured and the cheat menu popped up to overlay the screen. A new sword. New armor. Boots of the unfathomed initiate. Buffs. Debuffs. Permaboosts. Spells, allies, respecs. Genre shifts. A random save file just past the battle. Another one with maxed loot (with or without the cutscene). Each one reasonably priced. Stats on which items other players bought sorted by the number of attempts made to be the boss and the percentage of success players found beating the boss after each purchase. Suggested combinations given Mike’s play style and its lack of progress. Mike bought a save file with the post-battle cut scene so he wouldn’t miss any of the plot and trudged on to the next fight. I shouldn’t bother fighting. He sunk into his car seat, started the engine, and lost his nickel. Five cents debited to his driving school – the licensed learning fee he agreed to pay every time he drove in return for free driver’s ed a decade or so ago. He woke late, so he hurried to work, losing pennies every time he creeped above the speed limit, left off his turn signal, or eked through another rolling stop. For every infraction, his car’s onboard computer synched to his insurance profile, and his insurance company dinged his driving school (for instructional infidelity) which in turn dinged him for misdemeanor behavioral libel (for driving as if the school had not taught him how to drive). By agreeing to the charges, he built his debtor score and avoided the bandwidth costs of virtual court. He got coupons from his insurance company and driving school’s adfinity groups; for every hundred dollars he spent with them, another misdemeanor would be forgiven. All told, he took a two dollar hit for being late to work. Could have been worse. He unlocked the classroom door from the inside, just before the bell rang and the kids showed up for testing. Mike and his partner, Ethan, were badged creatives, meaning that if they worked any kind of arts or design jobs, a twelve percent tithe went back to their blended degree programs thanks to the lifelong learning licenses they signed so that they wouldn’t have to pay for tuition up front or take on short-term student loans – the only kind available to them when they were kids with low debtor scores. Some of that commission went straight back to their blended degree programs. Some went to the textbook and journal companies that accredited their programs through fidelity audits against scripted higher ed curricula. Drips and drabs of the money went back to the authors of articles and books deposited in the programs, accessible only by paying participants according to the semester-specific study windows in the curricula. To avoid paying that commission while he and Ethan saved up for a home, Mike signed up for a tour of duty teaching a pre-packaged sci-fi physics for gamers class (leased to the college by the entertainment industry and its educational publishing partners) in a dual enrollment course offered between the local community college and high school. The pay wasn’t great, but he kept most of it apart from the incidentals (like driving fees and video game unlocks) and taxes that he had opted to trickle out of his bank account daily, plus transaction fees. The convenience felt great. He had no idea what other people meant when they complained about doing taxes. He and Ethan had a saying every year: “Taxes? Who pays those things anymore?” It assumed a mimetic quality in their lives, and no matter how they misapplied it, most often it left them in stitches. Teachers and professors generated licensing fees for the schools and blended learning programs at which they worked. High school dropouts and graduates who didn’t go to college kicked back a flat five percent annual fee out of their pay back to the last schools the attended. Undergrads and college dropouts could pay their costs up front, take risky loans without the possibility of deferment after two years post-graduation, or sign licensing agreements that returned a portion of their pay – from jobs in their majors’ fields – back to their institutions of higher learning. The going rate was fifteen percent. Mike and Ethan had graduated when times were a little bit better – it had been a learner’s market. People stuck in dead-end jobs could always retrain and earn a quick badge from a ProMOOC that would help them job switch in return for what was usually a lesser licensing fee, like five to eight percent. Salaried professionals paid their fees monthly or in a fiscal-year-end lump-sum. Professionals working on commission – including creatives like Mike and Ethan – had to pay up at the end of each job that drew on their educations. Of course, so long as he taught, Mike didn’t have to pay any licensing fees at all. He was contributing to the system through his students’ future fees, and so all of his learning fees were forgiven. He hoped that the extra money he kept – combined with what Ethan (who was acknowledged as the more talented of the two) brought home – would put them in a starter home by the end of next year. Things were okay. He sighed. The kids started coming into the room. Today would be easy – he was just proctoring a test. What could go wrong? Mike pretty much just suffered through his day to day, face to face contact with his kids. He kinda sorta liked them and kinda sorta saw them as his obligation to Ethan and their shared life. What he really liked about teaching was the gambling. Each spring, the enlisted teachers – but not the badged lifers (who were assessed differently) – got to take calculated risks with their test scores. 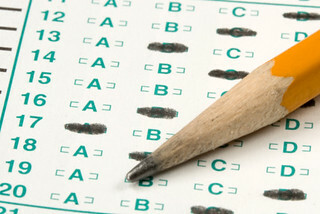 It was widely understood that a kid’s past performance on standardized tests predicted her future performance on other tests. No one expected enlisted teachers like Mike to work miracles. They taught to help the system tread water while the lifers did the heavy lifting of trying to move scores up a notch or two each year. Everything used to be so uncalibrated; entire divisions could swing up or down whole percentage points at a time in their pass rates, but the schools and their auditors, the test developers, had everything fine-tuned now. It was a game of tenths now. Perpetual testing. No one expected a school to get a 100% pass rate, but surely each school could work to half its distance to 100% each year. Or so the thinking went. So teachers like Mike – who, it was commonly believed, paused their lives to help their communities – got some perks to encourage them to try their best and exceed the system’s expectations of them. Life-long teachers got no such perks. The prospect of keeping a salaried job without licensing fees was meant to be enough to keep them in the profession, fighting for every hundredth of a point they could summon through their darkly scripted rituals. This year Mike thought he might come out ahead. He knew a couple of kids with whom he connected had made a lot of progress with him. He tagged them as “probable fail” and “guaranteed pass.” He thought he had the rest of the kids all sussed out as fails or passes based on the division’s correlation report that he had poured over first semester. He devoured that thing as if it was a game manual, carefully reading and re-reading each page to tease out the likelihoods of specific loot types and any available patterns of enemy or game designer behavior. He thought it was great that the division let him see exactly who it thought would pass and fail the tests before he even taught them. Easy money. Not much of it, but easy. Do no harm; keep to the script; go home. The day went well. No one upset the testing. The scores came back quickly – he did make a few bucks this year. Mike drove home slowly, looking forward to dinner, Ethan, his game. Dinner was great. Wilted spinach with pine nuts and a basaltic vinaigrette. Spaghetti squash. Some wine. Ethan complaining about his client. Again with the awesome writing about a not-to-distant future. There’s so much here that seems to be on the tippy edge of reality and I keep wondering why the kids haven’t revolted yet. I will continue to hold out hope. Yeah – this is mostly stuff that already exists, just exaggerated or reapplied. I’ve decided that I want my fiction to feel like an anxiety dream – unsettling because of its familiarity. Keep doing what you do and the tide will turn. You definitely have that genre down. I was just thinking it is interesting that your characters are aware of the tracking and monetization of their online interactions because we seem so clueless now, even though that is what is happening. I wonder if more people really understood, would we continue to be complacent? On a semi-related note, if I get one more person on FB posting a message about how the privacy terms have changed and that they are relying on some action by their followers to close the loophole, I may really lose it. I wonder if being informed would make us more alarmed or more complacent as a society. I worry that we have already normed ourselves, as a people, to pay for everything. The moment the legal frameworks pass for shaking us down for our media use and bad habits, we will have a choice we may not be able to handle – pay up or change the way we live. The cost of privacy will be finding a way to make stuff with resources we secure in onerously anonymous ways. I’m pretty sure I would compromise. The scary thing Chad is that what you present is an absolutely possible picture of the future, where every aspect of our lives is optimized for someone else’s benefit. The small penalties, aided by technologies to ensure that they are paid “fairly” are like the boot Orwell describes. I wonder if we will have the chance to live two lives, in essence, one public and traded on by for-profit companies, and one public that we keep open. I’m not sure privacy or “free” and “public” education will survive as we romanticize them. But, at the same time, learning and life will find a way. Is there where formal learning is heading? I’m not sure. I think part of it will. I think part of it will loosen up. Allowing ourselves to gift the best, most democratic teaching and learning to all students remains a big challenge given the pressures on schools and teaching. Thanks for reading and commenting, SheriO! Here’s a .pdf of the story for folks interested in downloading and e-reading. This is freaking Brilliant Chad, especially since when I followed a twitter link I had no expectation to fall into a narrative. The scenario seems both far fetched and plausible at the same time. I just try to imagine all of the negotiations and settlements to come up with these arrangements (I’d think more percentages need to be in the system to cover the legal fees). The negotiations and settlements and public ed grants will be sublimely terrifying if we let’em be.